Military jargon has changed over the years. A fort was designed to be a permanent structure. A military camp was designed to be a temporary structure. Today the terms are usually interchangeable. Both of these spoons were manufactured by Manchester Baker. Note that the design in the bowl is identical. The embossed bowl design was for generic purposes and we find several different camps using this design. 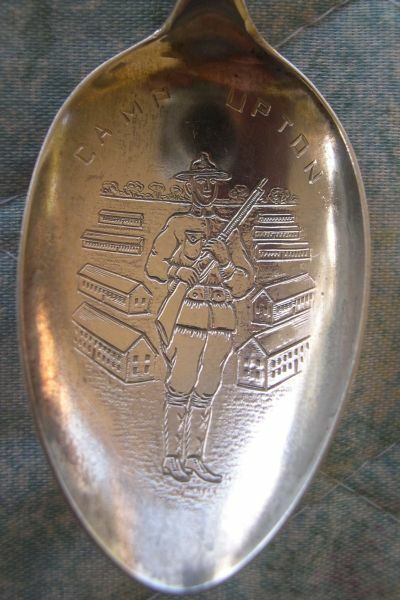 Spoon manufacturing was a very competitive business and the spoon makers were eager to produce spoons for any facility which would have buyers. Camp Dodge was started in 1909 as a training site for the Iowa Militia. and was named for Major General Grenville M. Dodge of Council Bluffs, Iowa’s most famous Civil War commander. Over the years, the camp, just northwest of Des Moines, has been expanded and is now about 6300 acres. Camp Upton named for Emory Upton, a Union general of the Civil War and was created in 1917 as a training ground for US soldiers in anticipation of entry into World War 1.